The KEF Q Series 7.1 package comprises two pairs of iQ50 towers, a pair of the entry-level iQ10 speakers and the iQ60c. KEF's PSW2500 subwoofer is an aesthetic match for the iQ series but we were supplied it with the HTB2SE instead, as it's often packaged with the iQs by dealers. The iQ50 floorstanders are best used positioned away from walls; at least 225mm from the rear and 1m from the side wall. That means you need room to breathe around the floorstanders. The iQ10 are more wall-friendly though, and there are foam bungs to reduce the low-end boost from the ports. One of the big advantages of KEF's speakers for home cinema applications is its patented UniQ driver, which features a 0.75in aluminium dome tweeter in the physical and acoustic centre of a 5.25in mid-range driver. This unit is common to all the speakers in the range (ensuring perfect voice matching), with supplementary 5.25in bass units in the floorstander and centre channel. UniQ typically has far wider dispersion than conventional discrete cone and dome drive units (Tannoy's Dual Concentric design has similar bonuses) because both treble and bass emanate from the same point in space. This makes the design ideal for delivering sound to more than a single-listener 'hot seat'. Dispersion is aided here by the new 'tangerine waveguide' at the heart of the UniQ driver – so-called because it looks like a tangerine. KEF claims it improves the delivery of the tweeter even more. The iQ50 floorstander is the big draw of this grouping. It's not too huge – standing 81.5cm tall on its baseplate – and at 10.5kg it's not too heavy either. But it sounds bigger and deeper than its basic specs suggest (just make sure you use that baseplate though; the speaker gets top-heavy without it). And it's beautifully finished. If the iQ50 is tall and elegant, then the iQ10 is simply a neatly truncated version of the same, losing the supplementary bass driver in the process. This lops off 10Hz from the bottom of the specification sheet (the iQ50 hits a claimed 40Hz, the iQ10 'just' 50). The iQ60 is a more conventional – if curved – centre speaker, with two bass units flanking that UniQ driver in standard D'Appolito layout, and is voiced for, er, voices, with a gentle roll-off at 65Hz. Using the same basic speaker design throughout – and a wide dispersion speaker driver at that – gives the whole KEF 7.1 package a seamlessness that really works with multichannel soundtracks. You can clearly pin-point individual sounds within the whole mix, but there are zero gaps as you move around the room, and absolutely no shifts in tonality. 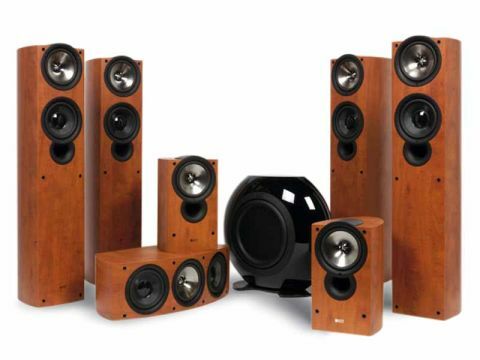 Indeed, you could probably evaluate the sound of this system on the basis of one speaker alone; if you like the sound of that one, you'll like the whole package. If you play exactly the same material through the different iQ speakers, it quickly becomes clear just how close they all are. The iQ10 is – naturally – the speaker with the lightest bass and the iQ50 has the deepest, but the difference is not jarring and consistency is king. This proves particularly handy when spinning Iron Man, a recent addition to my reference DVD collection. In the scenes when billionaire crimefighter Tony Stark is being chased by a pair of F-22 Raptors, the dogfight means there's a pair of jets behind you one second, to the side the next and in front of you soon after. At no time does the tonality of those Raptors change and you get to hear every last scad of detail. Far from being just a pair of generic jetty noises whizzing round the room, with the KEF system you can easily pick out the relatively quiet 'ripple-bang' sounds of the aircraft control surfaces being adjusted within the mêlée. The result is quite thrilling. Detail is one of the key 'other' strengths of the KEF sound, once you get past the seamlessness. Of great importance is the articulation of that centre speaker; it struck me as wonderfully transparent and accurate, with no accent to either male or – more significantly – female voices (many speakers seem to add a mild 'butchness' filter to some higherpitched vocals). Paradoxically, this manifested itself best through a guitar sound; Stevie Ray Vaughan, Live at the El Mocambo. Despite mixing the guitar sound down, this 1983 recording really came to life through the Q series, with Vaughan's epic rendition of Texas Flood towing the right balance between screaming your ears off and sounding too muted. A subwoofer is either discreet and pretends to be a rumbling side table, or it draws attention to itself in making a strong style statement. KEF's HTB subwoofer definitely falls into the latter category. It's shaped like the fat rear tyre of a motorbike, with the top and bottom lopped off. It can be laid on one side if you like, resting on a set of fierce-looking spikes, with the 250mm bass unit facing up, passive radiator facing down. Inside, there's a 250W class-D amplifier. Unlike the elegant wood finish of the Q series models, the HTB is more high-tech looking and comes in gloss white or black. I suspect the fact that it's clearly not a cosmetic match with the other enclosures will be a problem for some; if that's so, make sure you specify the PSW2500 when purchasing. Either way, don't be tempted to forego it. Bass reinforcement is a key element in any surround system; a subwoofer anchors the low-end, gives purpose to the .1 channel and gives the L/C/Rs more 'air' and transparency. You particularly need one to bolster the iQ50s, as they are bass-light. But with the addition of a sub, it's as if the speakers have a weight lifted from their shoulders. Once again, there's good integration across the frequency range and the 250W HTB is fast enough to keep pace with music, while still delivering the backbone needed for cinema. Overall, I was very impressed with this KEF Q Series package. They're big – but not too big – and work well with both movies and music. They also look classy. Consider them highly recommended.